The film is based on the book “Underground: Tales of Hacking, Madness and Obsession on the Electronic Frontier” . Very interesting to listen to Suelette Dreyfus’ podcast interview about the film at ABC Local Radio October 7, 2012 and read Christine Assange’ s review of the film at the Herald Sun October 06, 2012. Having watched the film on youtube the day before from the comfort of my kitchen, it was nice to scive from a prior engagement, hop on the train and tube, take a walk on the Southbank of River Thames in the mildly tempered early evening, and arrive at the British Film Institute in good time to enjoy its comforts and luxury. 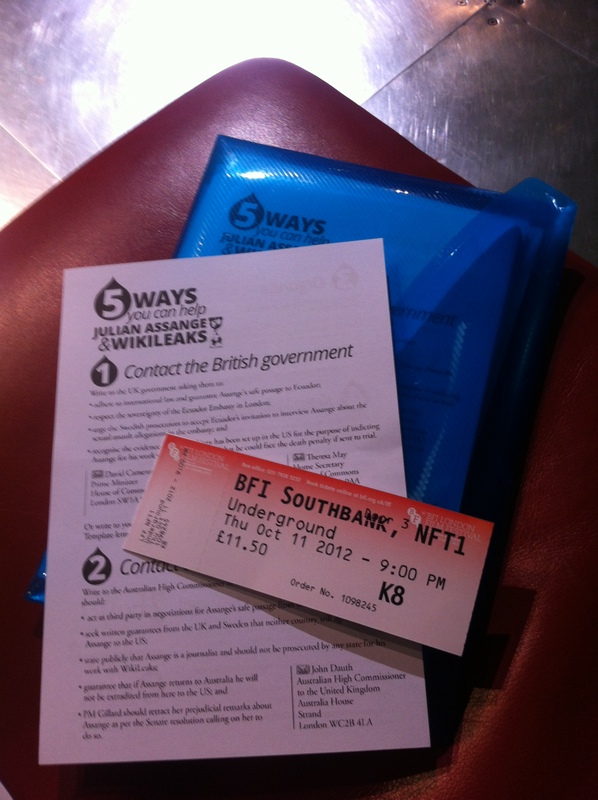 Watching the film on the big screen was exciting by itself but putting aside the entertainment/educational aspect of the film, my reason for going was to take part in the latest chapter of the WikiLeaks story and find the opportunity to support Julian Assange and WikiLeaks by distributing some flyers. A wonderful graphic designer Somerset Bean had put hours of creative work in putting together a large selection of posters and flyers all in support of WikiLeaks and its work and I had with me about 120 “5 Ways of how to help WikiLeaks and Julian Assange” flyers, looking simply fantastic and ready to spread the word. Waiting at the plush bar till the doors open with a mug of coffee I had a really nice chat to a young man who was waiting for a friend and had no idea which film they were going to watch. I passed a flyer and we talked about Julian Assange & WikiLeaks among other things… when his friend arrived we all realised we were all there for Underground, although I doubt we shared the same perspective. he walked off and I went to find Kay to tell her… we had to stop, she had a few things to say but I think we both felt numb. Went back to my seat with dampened spirits thinking who on earth would have complain and sat down considering my next step… then I saw not far from me a bright face with a mop of blond hair that I recognised immediately from interviews I watched… Jennifer Robinson! “Well she won’t complain if I gave her a flyer I am sure.. ” I thought, and off I went straight to her with a flyer and told her we were being stopped from distributing. Encouraged by her words and her actions, asking for some flyers and handing them out in the vicinity, (others helped too) I took courage and as I returned to my isle seat near the entrance I kept handing flyers as people came in and soon after that the lights were dimmed and the show started. I really enjoyed the film and thought it would be excellent viewing for the whole family. Having read the book (albeit in a rushed manner) I thought the story was a lot shorter than I remembered. I loved the fact that the script was action based, the actors were showing us what the story was rather than telling us about it, very lively style and the acting was good. I took it for what it was a televised story, how truthful it was to events I had no way of knowing… but I recall that although it kept you fully engaged with the story and the characters it did not have the same intense feeling of angst and heartbreak that permiated the original book, thankfully also less of the jargon which is entirely lost on me. 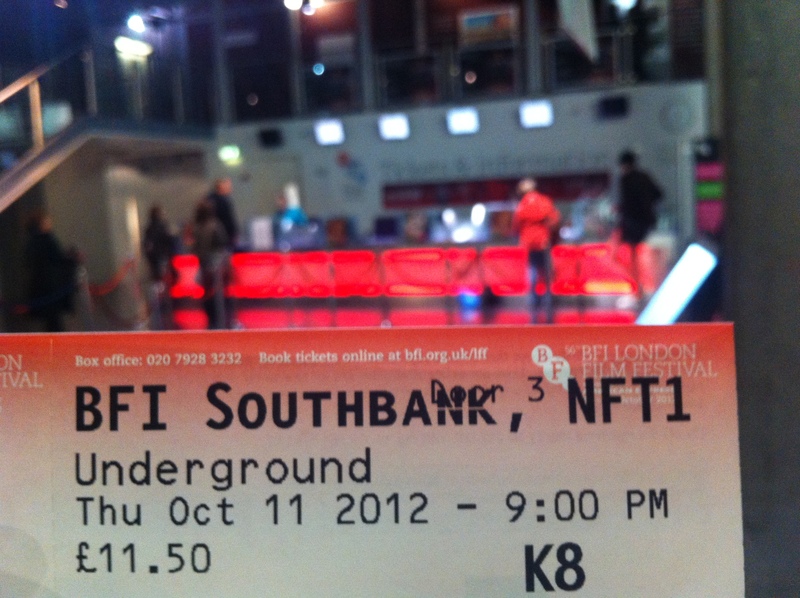 From a purely film viewing perspective, ultimately an individual experience, I can say that “Underground” left me with a compelling urgency to live my life to the full, and this is what I hope will stay with me longest. At the end of the film we had a special treat. Up came on stage the authoress, Suelette Dreyfus for a Q&A with an Australian interviewer. I was impressed at the ease of discourse, and thought what a wonderful opportunity to record the session and upload it on you tube and share it. So off I went to the front of the theatre with my i-phone and straight onto the front row…well pleased with myself and thinking of all of those who would love to watch this QA but could not make it. My excitement was short lived as yet again here comes “the gentleman at the door” and whispers in my ear “you can’t video this” here we go again… Dreyfus is talking about social media at the background and technology’s impact on our lives and here we have silly regulations derived by the media copyright industry telling me “you can’t do this” I felt once again my patience tested…”but this is not a commercial viewing, Dreyfus has not come all the way up from Australia to attend the screening of this movie at BFI to answer questions to an interested audience in order to make a million dollars… she has the script of her book on her online blog to download for free for the last goodness knows how many decades!! !” Could I utter my arguments and make a scene? of course not! so my reply to the polite gentleman telling me the rules of this eshtablishment is compliant… “oh ok” and I stopped recording only to turn it back on as soon as he left, at least for the audio part… “I could make a transcript…goodness it will take me all morning…” feeling all worked up and distracted, as I sat there on my seat boiling, having visions of being escorted out of the theatre. Due to all the distractions, I had to wait till I uploaded the audio files (part 1 and part 2) of the interview onto suncloud.com before I could appreciate its content fully. I hope you enjoy the recording. Thank you for your comment Guty 🙂 You are so right!